Until now, I had a rather positive opinion of Sidney Allen Johnson and his one-man-band Babylon Mystery Orchestra, but his fourth CD Axis Of Evil, a self-proclaimed politically incorrect piece of art, comes across like a right wing version of the Illuminatus trilogy, except that Robert Anton Wilson was always tongue in cheek and eventually never totally serious about it. BMO, on the other hand, warns of an imminent threat of a triumvirate of Islam, Socialism and the Illuminati which is out to conquer the world. Those of you of think the mainstream media really has a liberal bias, and that Fox News is “fair and balanced”, might still think that Axis Of Evil is the vision of a conspiracy nut. From a musical point of view, not much has changed. The songs have possibly become more compact than in the past. Apart from that, you still get dark industrial gothic hard rock / metal with Sidney Allen Johnson’s deep prophet of doom vocals. At times he’s switching over to acoustic guitar or piano to allow for some mellowness, but overall Axis Of Evil is a threatening piece of music which has a rather bass heavy production, but that’s probably intended to convey the sense of threat to the listener. 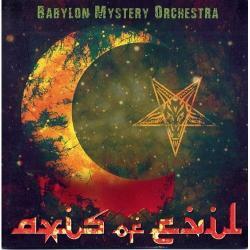 Is an album like Axis Of Evil to be considered dangerous? Actually I don’t think so. Mr Johnson doesn’t have the blue collar directness of other right wing bands like Stuck Mojo or M.O.D. His diligent quoting from dozens of different sources make him appear like a guy who probably has an extensive conspiracy library down in his bomb shelter in Alabama. I have to admit that there is a lot of detail in the execution of the work. Music, lyrics and layout all work nicely together. That doesn’t mean of course that Axis Of Evil is not an extremely offensive piece of art. Maybe Mr Johnson should meet an actual Muslim and see that most of them want to live peacefully just like most everyone else on Earth. I remain this time with a relatively low rating, which would have been even lower if I took his elaborations seriously.